When I met Gabreial... We have been together for seven and a half years. We met online when she sent me an IM because we have the same name. Met in person shortly thereafter, and haven't been apart for more than a day or two since. The second part to this story is that she had a son, now my stepson, whose first name is Wyatt. I use any excuse to do the robot. I have a piece of pencil lead in my right hand, been there since third grade. I sing old school rap songs like "Baby Got Back" in my best Frank Sinatra. I sound like Barry White when I wake up in the morning. 1. What would you say are the three most important things that you do to support Gabreial in her writing/blogging endeavors? I try to always listen to her problems or concerns. A trusted second opinion can be very important, especially to a writer. Next is letting her know that I support any decision she makes, even the difficult ones. Finally, we support each other in faith, reminding one another to trust the Lord. It is surely difficult at times. The most important thing is to make time for what is important to each of us, and make the most of what time we do have. This goes back to the the things that we do to support each other. Date night is a must. A standard night doesn't leave much time for us to enjoy each others' company, so a sitter and a Saturday night can go a long way. Plus, a DVR helps with our favorite shows...for a rainy day. The little things help a lot too. A simple note, or an unexpected stop at home during the work day can go a long way. I, admittedly, need to do more of this. and my wife is in the kitchen. If she wasn't a writer, she'd be a chef. She is a wonderful cook. She's really good about trying to make sure the evenings are about family time. Dinner is next, and then more work. I prepare my paperwork for the next business day, and she tries to wrap up her next feature. Then downtime. We try to end every night with the four of us in our bed reading a story, or listening to an online radio show for the kids called "Paws and Tales". 5. 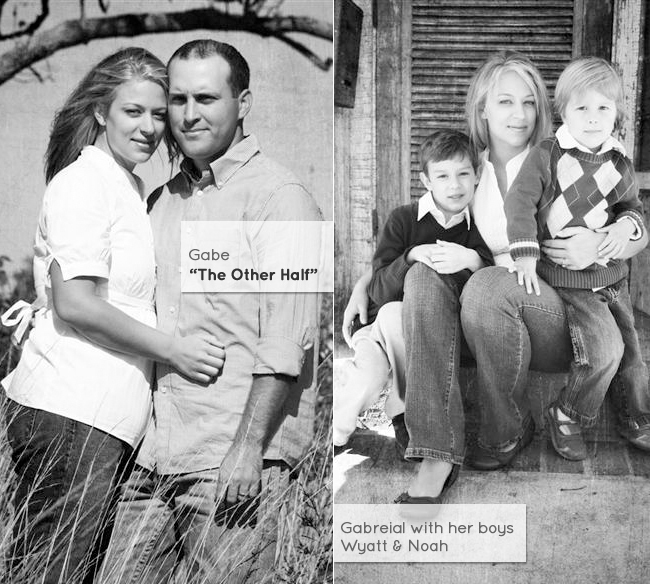 What is the easiest and hardest thing about being Gabreial's other half? The easiest thing is knowing she will always be there for me, no matter the situation. It is a wonderful feeling to know that you always have someone to turn to with anything. She is my best friend. There's nothing hard about it, sappy but true. So incredibly sweet....and how much do I love the idea of Gabe singing "baby got back" in a Sinatra voice? Awesome....:) Thanks guys! That's too funny how they met! um, it's really funny that you met because you have the same name! i dated a guy with the masculine version of my name once. . . this interview totally has me choked up! Aww this is soo sweet..now I have to go read all the other Other Half stories!